I have a problem with March, though it’s a welcome one, with just too many pictures that I like to put in a single post. It was a busy month, with lots of events and more varied than most, and so I’ve decided to split the month into two – and here are the pictures from the first half of March. A good example of why I sometimes like the 16mm end of the 16-35mm, working as I was absolutely jammed into a crowd in front of McDonalds. Perhaps even a millimetre or so wider would have been even better, though I like the tight framing with the hand at top left and another at bottom right cut off – perhaps just a little too dark in the web version, with the arm and the hand holding the microphone at the edge of the frame. 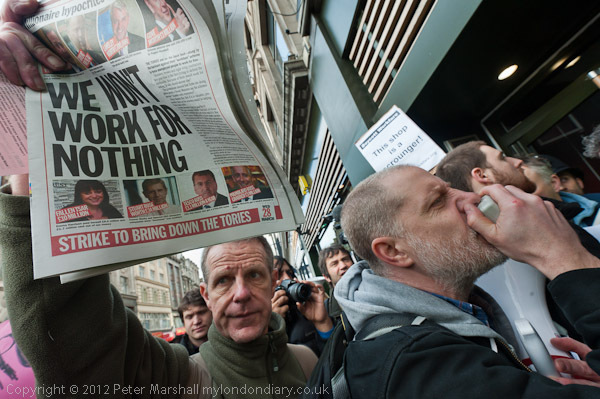 The ‘rogue’s gallery’ in the newspaper along with its captions really sums up what the protest is about – and there’s a placard too, with the message ‘This shop is a scrounger’. The only thing really missing – or rather not prominent enough – is the yellow M on the very recognisable dark green of the shop front – it is there dead centre in the image but rather small, and has lost a little saturation thanks to surface reflections. 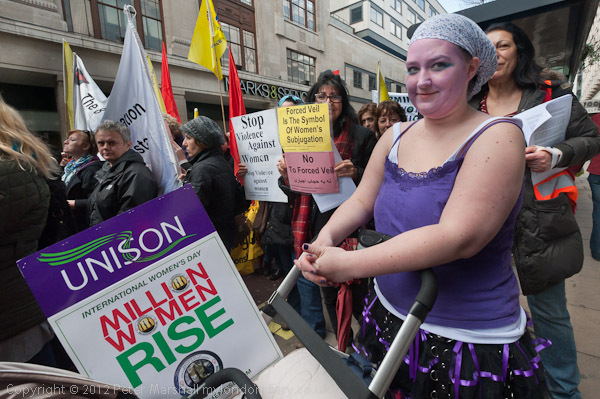 I think this woman on the march did have a child in the buggy, but I’ve chosen to concentrate on the Unison poster which again says what the event is about, along with the placards held by the women in the background. But it’s the dress, makeup, posture and gaze of the woman leaning on the push-chair that really make the image. Looking at the full size image the others behind her – from the 8th March Women’s Organisation (Iran/Afghanistan) very much add to the interest of the image. 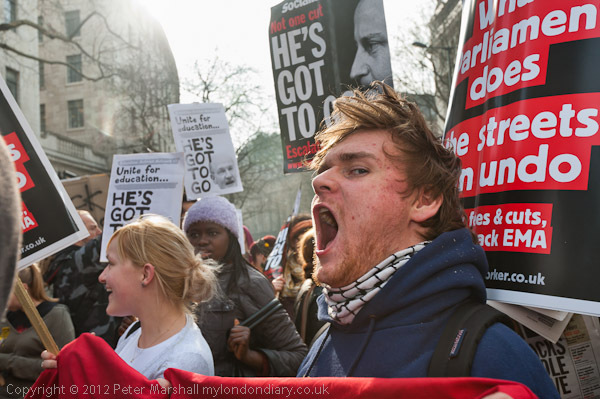 Another picture of a woman on a protest, but very different. Taken in low light, with the 16-35mm at 29mm and full f4 aperture, ISO 1250, 1/30s. The close working distance and fairly wide aperture make her stand out, almost sharp (a little movement blur) against the out of focus background. 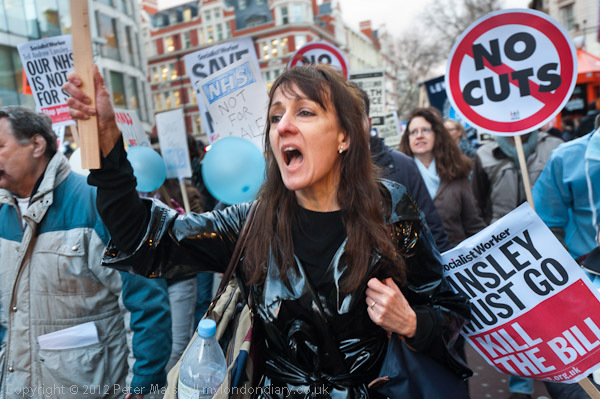 There’s a great energy in her shouting and gesture, holding a placard up out of picture, and although her placard isn’t in the image, others tell clearly what she is protesting about. The slight lack of critical sharpness isn’t apparent on the web, but helps in the full size image, and the picture is really ridiculously sharp given that she is shouting and walking forwards and I’m walking backwards a short distance in front of her during the 1/30 of a second. The man in robes holding the picture of another man in robes with a rather similar hairline and both wearing glasses made a fairly obvious image and one I had several attempts at. This (at least for me) stand out partly because of the framing but also the background, with another framed image held up just to the left. 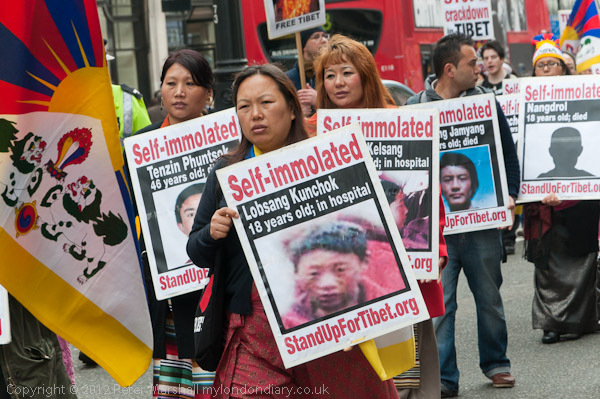 My Tibetan protest photographs do rather tend to be overwhelmed by the yellow, red and blue of the Free Tibet flag, and it’s good to have a picture with it present but not dominating. This was on the D300 at 70mm – equivalent to 105mm on full frame. 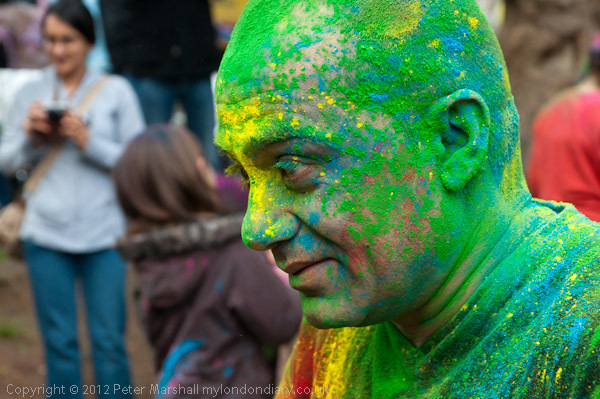 Another different image of a man’s head which for me caputured some of the colour and confusion of this paint-throwing event. The head stands out well from the background, and again this was with the D300 and at 58 (87m). F7.1 according to the EXIF, which has done a great job in giving just enough depth of field. And finally from the first half of the month, another protester shouting, taken fairly close with the 16-35mm at its long end. Perhaps surprisingly this is the only picture in these half-dozen where I used flash, working very much into the sunlight that was coming past the edge of the building (giving a little flare and ghosting at top left) and giving the strong rim lighting on the main figure – with some very sharp whiskers along the edge of his face. It’s that wide stretched mouth that is the main feature, head thrown back to give that hair, and the beady eye towards the photographer. Flash has lifted his face just a little, and I suspect I’ve had to burn down a little, particularly inside his mouth, though it’s still perhaps a slightly too detailed dental view of his upper set. The red along the bottom of the picture and in the placards. More from the second half of March later. This entry was posted on Saturday, December 22nd, 2012 at 11:00 am and is filed under My Own Work, Photo Issues. You can follow any responses to this entry through the RSS 2.0 feed. You can leave a response, or trackback from your own site.